I always try to bring back new flavors and inspiration from my trips. 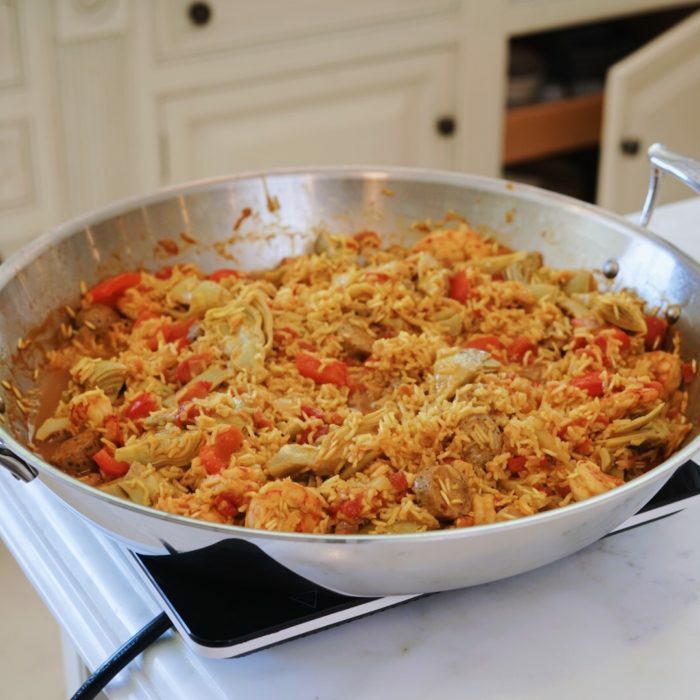 I had this delicious Paella back in Spain but have always been intimated to make it. So this time I thought that I needed to come up with an easier version, which takes way less time to prepare but tastes just as good!! I took me a few tries but finally this version came up really nice! In a large pan (keep in mind that you will cook everything together in the same pan, so it needs to be big enough to hold it all) cook the shrimps with a bit of olive oil, salt and pepper for 2-3 minutes. Remove and keep on the side. In the same pan, sauté the onion, garlic, fennel and pepper with the olive oil for a few minutes on medium heat ( be careful not to burn the garlic). Add the sausages and cook for 5 minutes. Add the paprika and turmeric and combine it all together until everything is nicely coated with the spices. Add the rice, mix and add 1 cup of the stock at a time, bring to boil and then simmer until the rice is cooked. You will have to add more stock as it goes as you do not want to add it all at once. 5 minutes before it is cooked, add the peas and artichokes hearts and stir. Finally toss in the shrimps and enjoy!! !